A beautiful, sensuous surface is one of the principle goals of meticulous drawing. For the past 500 years, certain artists in each era have maintained fine rendering and attention to surface as a priority in their work. Making these beautiful drawings requires different skills from making good paintings. Many talented painters lack the light touch and sensitivity to produce a sensuous surface on paper. 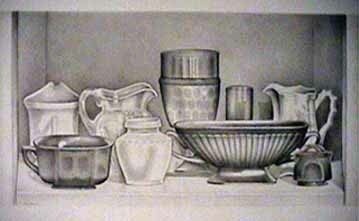 Perhaps the ultimate tool in the meticulous technique is a medium called "silverpoint". 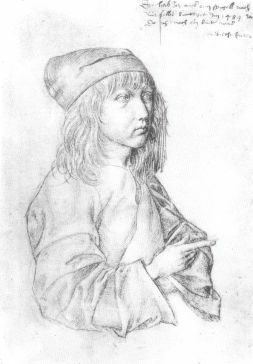 Metalpoint drawing dates from the Renaissance era well before the use of graphite or "lead" pencils. Any metal in wire form can be used to make drawings: copper, gold, platinum, bronze or silver. So, silverpoint is, in fact, a specific type of metalpoint drawing. 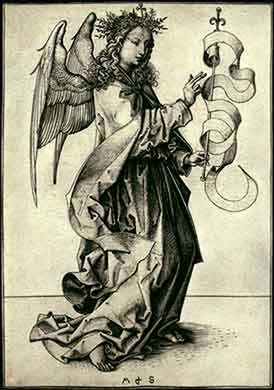 Martin Schongauer, the 15th century draftsperson, engraver and teacher of Albrecht Durer, was an early master of meticulous drawing technique. Work on unforgiving metal engraving plates demanded extraordinary finesse and skill; Renaissance printmakers were highly motivated to develop their precisionist talents. In this engraving, Schongauer shows the elegant, serpentine line that is also readily achievable with silverpoint. A close-up of the engraving reveals the technique called "single hatch"--so named because all the lines go in the same direction. Using silverpoint, tonal differences are built up very slowly and the resulting tonal range is narrow--so the contrast is low--as in this Durer portrait. 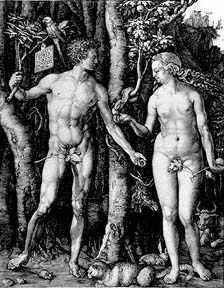 Albrecht Durer's pen and ink drawings often use single-hatch technique as do certain of the artist's engravings, but the darker, denser engravings such as the "Adam and Eve" shown here are multi-hatch. Artists, whether Old Master or contemporary, who are most successful in silverpoint drawing are those with a deep concern for beauty of surface. 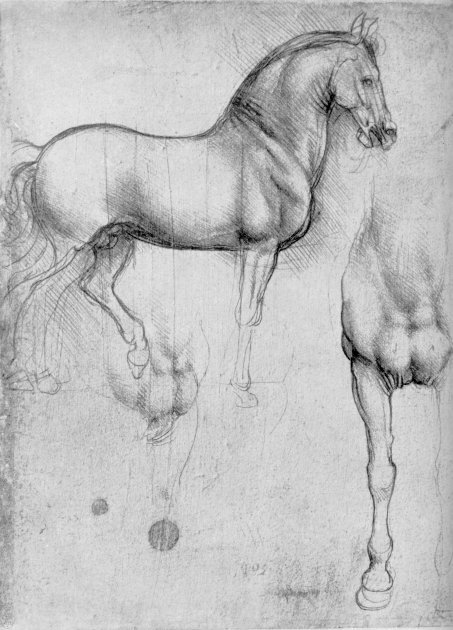 So an artist such as Leonardo, who was perhaps the most sensitive draftsperson in all art history, is much more successful in silverpoint than an artist such as Michelangelo who is relatively heavy-handed in his drawing. Interestingly, the Venetian painter Canaletto is a master of the sensuous surface and light touch in his pen and ink drawings and etchings--but not in his paintings. 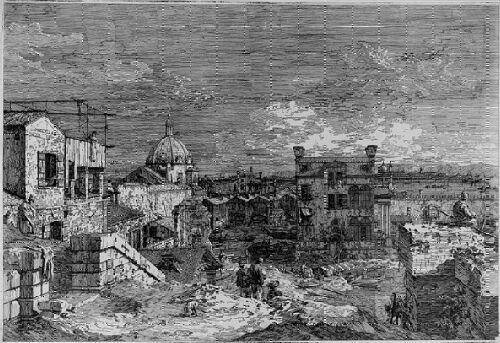 This etching gives a sense of Canaletto's finesse in handling line; it is remarkable that this work is from the hand of the same painter whose major output was the stiff, uninspired tourist paintings of Piazza San Marco. 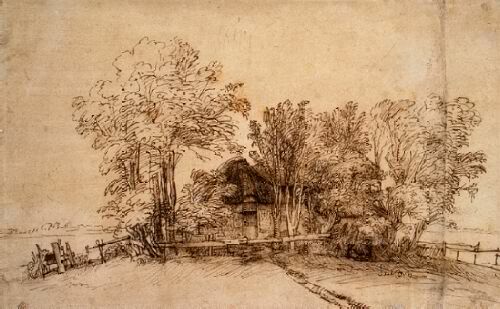 This pen and ink drawing by Rembrandt shows the artist using single-hatch in a broad way. His marks are relatively strong with the single-directional strokes giving a visual rhythm--rather than a refined continuous surface--to the drawing. 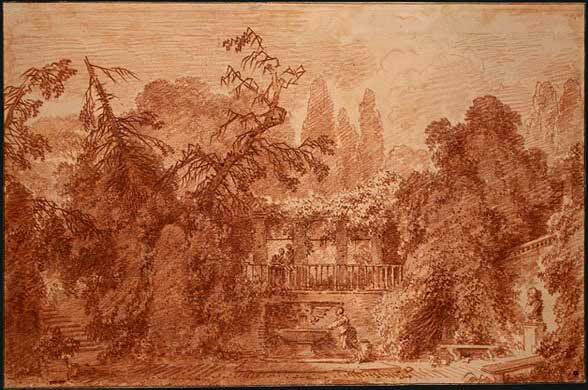 In this drawing, 18th century French painter Jean Honore Fragonard creates a beautifully sensuous surface with the single-hatch technique. 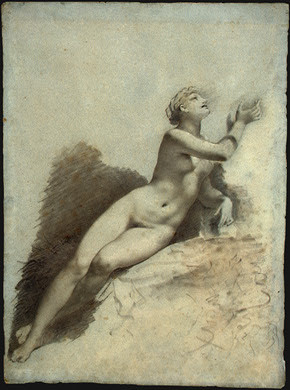 Another French artist of the period, Pierre Paul Prud'hon uses the single-hatch technique then rubs it slightly to get a slightly softer smudged effect. This work--a chalk drawing not a silverpoint--shows the extremely beautiful surface that Prud'hon achieved with a tricky technique that, if mishandled, becomes murky, smudged chaos. 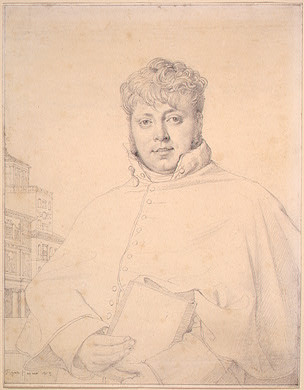 In the 19th century, the noted French portraitist Ingres employed the slow buildup of small marks and works in a very narrow tonal range as in this graphite drawing. 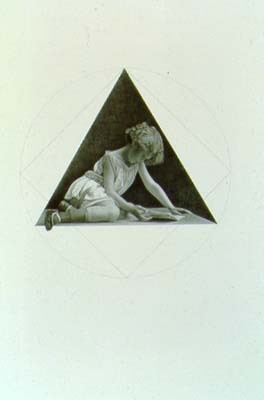 The 20th century meticulous draftsperson continues to use the single-hatch technique; we see this in contemporary artist John Wilde's silverpoint at the left. In this drawing, Wilde's Surrealist figurative image has the sense of an earlier period because it floats unattached to any anchoring background. In general, prior to the 20th century, draftspeople didn't take responsibility for the whole page. Most of early silverpoint drawings are of a central image with a considerable area of vacant space surrounding it. Many contemporary artists have chosen to work the whole page. This drawing by Bill Richards shows this tendency in the extreme. 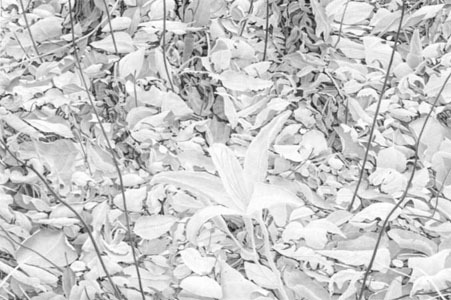 Richards is a well-known artist working in a meticulous technique who creates very sensuous surfaces; his drawings are not silverpoint but remain in the low-contrast world of a 5H to 9H graphite. Both Victor Kulbak and Bill Richards' teacher Joe Smith create drawings with a slow building up of subtle contrasts. Marilyn Rabetz uses colored pencils but with this same painstaking layering. 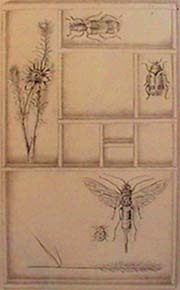 Peggy Preheim combines the technique of single-hatch with a reinforcing layer of tiny circles to add intensity to her work that features a small-scale image as the focal point of a large, otherwise empty sheet. Meticulous technique is not confined to Realist artists. Dotty Attie uses meticulous drawing to interpret fragments of artworks interspersed with words in the style of the Conceptualists. 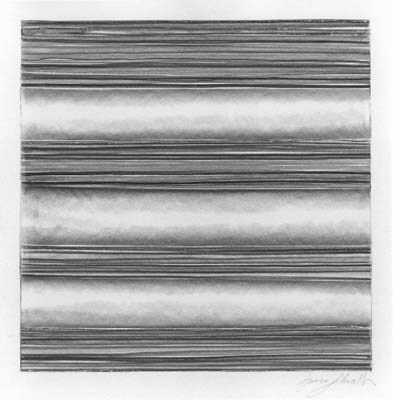 At right is an example of Susan Schwalb's use of silverpoint in a most unexpected approach to minimalist abstraction. Ben Shechter does the unusual in sometimes moving from figuration to landscape in his silverpoint drawings. In my later career, I (Laura Shechter) have moved away from silverpoint to a significantly softer 2H pencil to make more "baroque", higher contrast, works. This silverpoint Bottom Shelf dates from around1980, my earlier--more patient--period. The tool for holding the metalpoint wire is called a stylus. The modern version of the stylus is a "pin vise" which, like the holder for an Exacto blade, tightens to grip the wire and hold it securely in place. To sharpen the metal wire point, one uses a sharpening stone in a rotating motion. The initial point takes a long time to achieve, but thereafter the sharpening process is less arduous. In order to accept the metals mark, the drawing surface needs to be a prepared commercial paper (these are coated with base-chalk or with clay as in the case of cameo papers) or alternatively a hand-prepared gesso, tempera, or gouache surface to which the wire residue will adhere. All metalpoint materials will oxidize and darken over time eventually giving the drawing's surface a slight shimmer. Silverpoint takes on a slightly brownish color, copper a greenish cast and bronze a yellowish cast. Exposure to sunlight speeds the oxidizing process. Working with silverpoint takes practice. It may be best to train by working with a very hard pencil--such as a 5H graphite. Because silverpoint uses a sharpened wire, there is a tendency to dig into the paper's surface making holes. Silverpoint cannot be erased or changed. The surface is brittle and unalterable; so silverpoint is a medium inappropriate for loose sketching. Errors are best made in the preparatory phase before transfer to the final paper. 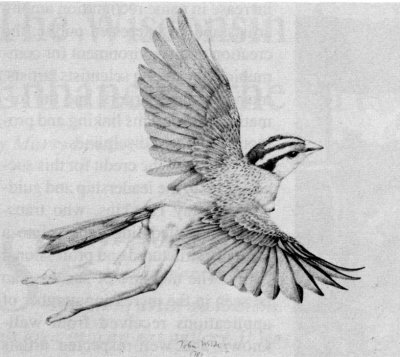 Silverpoint technique is developed by practice: consider picturing the point as a feather, making a stroke heavier at first and lighter at the end. Learning to control silverpoint is very useful in training the hand for creating graphics; it makes drypoint possible and etchings or lithographs easy. In terms of costs of materials, silverpoint is an inexpensive technique in which to work because a few inches of wire will last a lifetime. But in terms of labor and patience, it is a very costly medium. Silverpoint is a time-intensive process; typically a finished 8" X 10" drawing takes 100-200 hours to complete. BIDDINGTON'S reports today's art buzz gleaned from artists' studio visits, art events & art gallery openings. and BIDDINGTON'S upmarket, online art & antiques auctions.